With Charles Dickens Writes A Christmas Carol by Richard Quesnel, Lost & Found Theatre has unveiled its largest production ever. It has a cast of 19, a two-storey set and a choir. The show is also thoroughly delightful and it would not be surprising if it became an annual event. Quesnel’s adaptation of Dickens’ classic tale is different from other stage and film adaptations in that it it sets the tale within a frame concerning Dickens himself. Quesnel’s depicts the origin of A Christmas Carol as the result of Dickens’ dispute with his publisher William Hall. Hall (Vince Carlin) is unhappy that Dickens’ latest novel Martin Chuzzlewit, then in serialization, has not been a success. Hall visits Dickens (Gareth Potter) on Christmas Eve 1843 and rejects Dickens’ newest work which is a sequel to Chuzzlewit. Hall insists that Dickens must produce a hit book by 9am Christmas Day or the publishers will drop him from their list. Dickens locks himself in his study and works through the night. Hall becomes his character Ebenezer Scrooge and Dickens himself becomes Bob Crachit. The carolling Dickens hears from outside his window influences the theme of humanitarianism or “good will toward men” that the story promotes. early poverty and that of his father had supplied him with many more serious examples of man’s unkindness to his fellow man. What is true, however, is that Dickens’ notion of what “the spirit of Christmas” is has imprinted itself on the holiday ever since the story was published. Dickens was inspired by the sentiments expressed in Christmas carols, a tradition being rediscovered at the time, and even called the chapters of his story “staves” as in music rather than “chapters”. We thus have to regard Quesnel’s history of the writing of A Christmas Carol as a fiction that allows Quesnel to have Dickens act as the narrator of the staged story and have Dickens and his family and Hall play the roles of their supposed counterparts in Dickens’ tale. The most effective use Quesnel makes of his framework is to show Dickens considering various ways to present a character like Marley (Ted Follows). Early in the show when Dickens keeps changing his mind about Marley’s personality and profession, Follows appears and acts out each idea on stage to humorous effect. The most effective use Quesnel makes of the influence of carols on the nature of Dickens’ story comes from liberally interspersing the staging of the story with Christmas carols sung by strolling singers. The carollers passing by help change the scene and set the mood. Quesnel achieves the most delightful effect from this when the spirit of Christmas Present shows Scrooge the world. Two miners at one side sing a carol in German, a lighthouse-keeper to the the other sings one in French, a sailor in a crow’s nest sings one in English and a boy at the bow sings one in Italian. This is an imaginative way to show how widespread the celebration of Christmas is. Gareth Potter, best known for his twelves seasons at the Stratford Festival, distinguishes Charles Dickens and Bob Crachit primarily by giving the latter a lower class accent. Otherwise, he plays the two as similarly overworked but ultimately optimistic men. Vince Carlin plays his two roles as Mr. Hall and Scrooge as virtually interchangeable, with Hall, strangely enough, coming off as essentially meaner than Scrooge who seems merely curmudgeonly. Ted Follows keeps his two roles of Jacob Marley and Old Joe quite distinct. Follows, laden with chains as Marley’s ghost, is very effective, recalling Shakespeare’s ghost of Old Hamlet in the intensity of the suffering he communicates. As Old Joe, he is completely different, a servant indecently gleeful at seeing stolen items belonging to the dead Scrooge of the future. Brad Cook also keeps his three roles completely separate. As Scrooge’s nephew Fred is is good-humoured but justly worried about his uncle’s negative attitude. As the ghost of Christmas Past he is austere and comfortless. As the ghost of Christmas Future he doesn’t speak at all but manipulates a larger-than-life-sized puppet with elegant but emphatic gestures. Reid Spencer likewise distinguishes among his three roles. 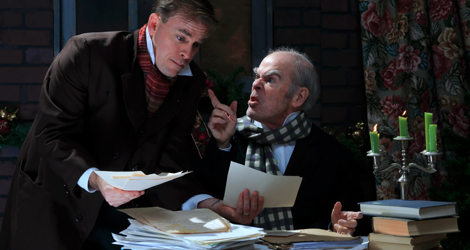 As the Solicitor who tries to get Scrooge to donate to charity he is all seriousness, as Mr. Fezziwig he laughs heartily and is bursting with joy. As the ghost of Christmas Present, he uses his deep, sonorous voice to great effect as he calmly shows Scrooge the many ways that Christmas brings people together. Near the end of this role his sudden transformation from liveliness to weakness, robustness to age, is shockingly potent. Like Potter, Christy Ziss distinguishes Mrs. Dickens and Mrs. Crachit primarily through accent, both characters being concerned for their husbands and keen to protect them. As Old Belle, however, she sounds a note of happiness devoid of worry. Kathleen Sheehy is a delight as Dickens’ nosy maid Mrs. Dilber and as Mrs. Fezziwig, who matches her husband’s boisterousness. Hannah Ziss turns all five of her roles into vivid portraits that include Belle, the sweetheart Scrooge could have had if he had curbed his love for money. Mention must be made of two younger performers whose do impressive work. Parker Merlihan plays a Boy, Young Scrooge and Young Crachit with confidence, while Dylan Thomson is endearing both as Young Charles (Dickens) and as Tiny Tim. Not only is the play enhanced by the frequent use of carols, but choreographer Jackie Titus turns Mr. Fezziwig’s ball into a full-scale dance interlude with the entire cast doing period dances like reels and quadrilles accompanied by live music while Alten Wilmot and Lillian Ziss perform a pas de deux. Lighting designer Kirsten Watt and sound and projection designer Rob Ring create create atmospheric special effects for the doings of the four spirits. The transformation of Scrooge’s door-knocker into Marley’s face was enough to startle everyone. 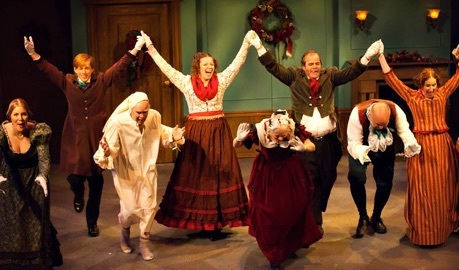 Since Quesnel’s play really has far less to do with Dickens writing his famous story that with telling the story itself, a better title of the play would be A Christmas Carol: A New Adaptation by Robert Quesnel. Audiences would then know they would see the entire story, in a more complete form than most, rather than an examination of an author overcoming writer’s block. In any case, Quesnel’s adaption gives the old tale new life and the use of song and dance turn the show into a real celebration of the season that both adults and children are sure to enjoy. Photos: (from top) Gareth Potter as Bob Crachit and Vince Carlin as Ebenezer Scrooge, ©2015 Tom Vogel. 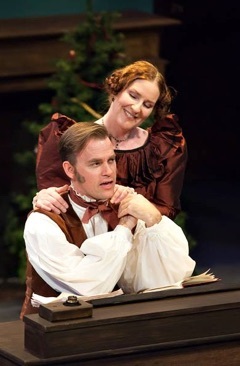 Gareth Potter as Charles Dickens and Christy Ziss as Mrs. Dickens; Hannah Ziss, Richard Marchment, Vince Carlin, Kathryn Marchment, Kathleen Sheehy, John Bigelow, Reid Spencer and Christy Ziss, ©2015 Tina Weltz.